The Israeli foreign minister and head of the right-wing Yisrael Beiteinu party Avigdor Lieberman suggested during a campaign event that Arab citizens of Israel, who are disloyal to the state, deserve to be decapitated. "Whoever is with us should get everything," Lieberman said in a speech at the Interdisciplinary Center in the western city of Herzliya on Sunday. "Whoever is against us, there's nothing else to do. We have to lift up an axe and remove his head, otherwise we won't survive here." During the rally, the nationalist leader declared those who raise the black flag on Nakba Day, the day Israeli Arabs and Palestinians commemorate the creation of Israel as a tragedy, do not belong in the state of Israel. When an Israeli-Arab student expressed unease and asked what the minister proposes to do with her under this plan, Lieberman responded that he expects all people regardless of religion to respect Israel and to serve in Israel’s military. Lieberman also reiterated his party’s platform to integrate parts of Israel populated by Arabs into the Palestinian state, in exchange for areas of Judea and Samaria. “There is no reason for Umm el-Fahm [a large Arab-populated city in the north of the country] to be a part of Israel,” Lieberman said. Israel took control of Umm el-Fahm in 1949 after an armistice agreement between Israel and Jordan. Lieberman made these remarks ahead of Israel’s March 17 general election. Several officials have spoken out against Lieberman’s comments. 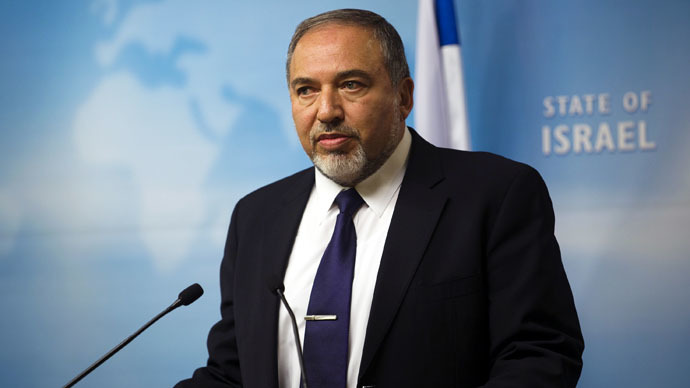 Former ambassador to South Africa and Foreign Minister Director-General Alon Liel, as well as former ambassador to France Daniel Shek, pointed out the hypocrisy of Lieberman’s words, the Jerusalem Post reports. "Israel's number-one diplomat is waving an axe over the heads of citizens of the country that he represents, and in the same breath, he preaches to the whole world about fighting anti-Semitism," they said. David Harel, an Israeli peace activist, told RT that though Lieberman's statements were disturbing, they did not come as a surprise. “Before elections people make slightly more extreme statements than they would have otherwise in order to possibly pull in undecided voters,”he said. “Can you imagine John Kerry making a similar statement about the Mexicans, or the Hispanics, or the Blacks in the United States. Imagine John Kerry saying publically that you have to have their heads chopped off with an axe,” Harel added.